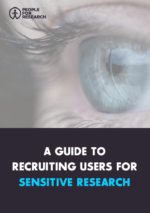 We put together a guide outlining how to approach user recruitment when working on research about sensitive topics, or if you are concerned you might need to speak with vulnerable participants. The team at People for Research recently conducted a project with a registered charity who provide support to anyone in emotional distress, struggling to cope, or at risk of suicide. Unsurprisingly, this was a very sensitive user research recruitment project, one that required us to fine tune and make the most of our empathy skills. The researchers wanted to speak to 20 people who had either experienced feelings of suicide in the past or were currently having such thoughts. They were also interested in speaking to people who had helped someone who had felt this way in the past or was currently experiencing feelings of loneliness or depression. We learned a lot from this experience. Although it was extremely emotional at times whilst we were in the process of finding out more about the users’ stories, the outcome was very positive and rewarding not only to us as a team, but also to the researchers and the participants who took part in this project. When reading the brief for the first time, our initial thought was “how are we going to approach such a sensitive topic and potentially delicate audience?”. It’s not like we were approaching sensitive user research recruitment for the first time; we had been previously involved in research projects with sensitive groups such as people looking to file for divorce and couples going through counselling, so our team knew we had the necessary experience to deal with emotional subjects. However, facing this new challenge felt like a step further into this territory. This was the first time we were preparing to explore a project related to suicide, so we wanted to ensure that we approached the research in a sensitive and empathetic manner due to the need to involve potentially vulnerable people. To achieve this goal, we worked with researchers at the charity to ensure our approach was appropriate and not going to put people at further risk. Throughout this project, we found that the key was to really listen to the participants and stay close to them during the process of screening and taking part in research, ensuring they were comfortable at every step of the way. Following our two-stage screening and our three-stage confirmation processes means our team spends a relatively long time building a relationship with each participant ahead of the research session, so we wanted to ensure that our communication was coming across as soft and empathetic from the beginning. We started by fully understanding what the client needed from this project and then worked closely with our marketing team to tweak the content that would become our first point of contact with the participants: our landing page and email. We worked our way through multiple versions of our message to make sure our words made us look approachable and friendly, but also respectful. It was important for us to remember that although most participants who saw this message would probably have had some previous contact with us either by following us on social media or by being a part of our online community, some people would land on the webpage without any idea of who we were. Hence, our need to also plant a seed of trust on the people who knew nothing about People for Research and user research in general up until this point. One of our focal points was to always make sure that people interested in taking part knew they could drop out at any stage, should they not feel comfortable. After all, they didn’t know the team members speaking to them or the researcher, so we had to be prepared for them to change their minds and leave the project. It was important to keep reminding the users that they could refuse to answer any questions and that this user research study was not primarily focused on their personal experience. Sensitive user research is not necessarily about getting people to share their stories – or, in this case, their struggles –, it’s about making sure their background makes them relevant to answer a few questions or test a website that is being built for them. Creating dedicated content also meant being extra careful when creating our online questionnaire and planning our first phone call, the steps that make up our two-stage screening process. This meant our tone of voice had to be crafted not only during the calls, but in all online communications too. We made sure all participants were briefed fully about the nature of the research and the researchers also briefly introduced themselves to the participants ahead of the research, so that everyone knew who they were meeting with. This further reassured and relaxed everyone taking part. As part of our three-stage confirmation process, our team called everyone on the morning of the research to see how they were feeling and to ensure they were relaxed and ready to go. The results were incredibly useful to the client’s research and all participants felt positive from taking part in the research. We believe they felt empowered talking about their experiences and thoughts, feeling that they were making a difference to the support available for other people going through a similar experience. We learned a lot about working with this very special group of people: it was essential to take a different approach, one that required us to use our empathy skills and walk in our participants’ shoes; We felt excited to see that it worked and helped the researchers to find the answers they needed. 1. To be aware of the audience and be sensitive, to show empathy and dedicate time to each participant. 2. To focus on the positives of the research and how their experience can make a difference. 3. To fully prepare the participants ahead of the research including sending an introduction to the researchers. 4. To follow up with each participant afterwards to ensure they were okay and to gain feedback thus making them feel that it was an end to end process that they had been involved in. In the words, of Annette Priest, “be present for those emotions, and help your participants talk through those emotions”. Click here to watch Annette’s talk at last year’s Collaborate Bristol, where the UX researcher focused on researching with people and preparing for their emotions.